This article is about the Microgame in WarioWare: Twisted!. For the item in the Mario & Luigi series, see Nut. Info "Nibble away 'til it's gone!" Nuts! is one of Kat and Ana's microgames in WarioWare: Twisted! The game's purpose is to press the button repeatedly to make the squirrel eat the nut. Each increasing level requires the squirrel to eat something bigger, making it harder for the player. 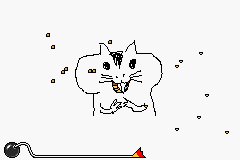 1st level difficulty: The squirrel eats a small grain. 2nd level difficulty: The squirrel eats an acorn. 3rd level difficulty: The squirrel eats a nut. This page was last edited on November 17, 2018, at 03:07.